Click on photo, then select the Set it is part of, then select “slideshow” for detailed Market set-up..
Marketing includes Wholesale, retail, subscription, contract and other forms of connecting consumers with our product. 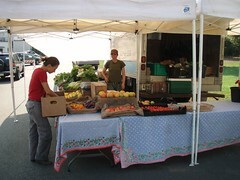 North Slope Farm is currently focused on Retail sales at Farmers Markets. We harvest and handle the products, then load up our truck and try to sell out. Critical to successful marketing is great record keeping and great people skills. For us to succeed we focus on colorful, diverse displays that are easy to replenish and for customers to comfortably serve themselves. Prepared by RCM, November 2011. Reviewed and Edited by MikeR.